Hi! I'm back from Edinburgh, Thanks to Dan for putting us up (and putting up with us!) in his lovely new flat in Harrison Gardens. It was great to see you again! So, how did we go about choosing what to see while we were at The Fringe? 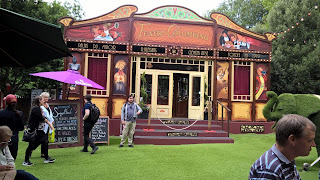 Well - we had only booked one show before we got there - the wonderful Time-Travelling Magicians Morgan and West. They were doing some close-up table magic in an intimate venue and we didn't want to miss that! We have seen them before - so we knew it would be good. Apart from that though - how on earth do you go about choosing what to see from over 2000 shows at the 250 venues around the city? We decided to just wing it! We'd turn up and see who gave us the most interesting leaflet/was most enthusiastic/looked most crazy and go with that. 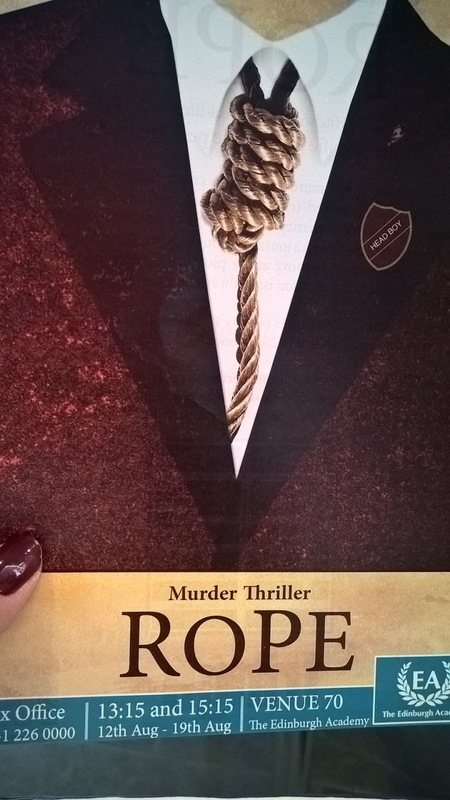 On the first day we walked down the Royal Mile and a very nice bespectacled man gave us a leaflet about a show called Rope. He was falling over his words with the excitement of telling us what it was about. 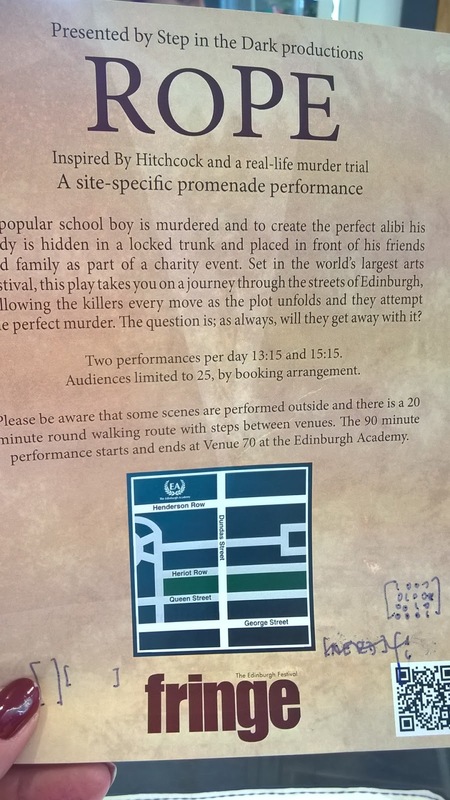 It involved a real-life murder case in Edinburgh back in the nineties combined with a Hitchcock film and what's more it was a promenade play! This meant that we'd be following the actors from place to place as the plot unfolded. How could we resist - especially as he offered us 3 tickets for the price of 2. We were sold - and he phoned ahead to the venue to book us in. 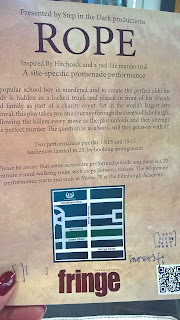 We had to go to the prestigious public School - the Edinburgh Academy as the play started in the library there. It was a gorgeously hot and sunny day and we met in the Edinburgh Academy's courtyard. Our herder (a very nice man employed to shepherd us around after the actors and keep us from getting run over when we crossed Edinburgh's New Town roads) led us into the library, where we stood among the pillars waiting for the play to begin. There was a metal trunk in front of us - which it turns out contained a dead...well maybe I shouldn't give away the plot in case any of you get to see it elsewhere. What followed was a fantastic story, some scarily good actors and a 90 minutes exhilarating walk through the streets and even into a cocktail bar, while the story unfolded before our eyes. After it was done we found the wonderful New Town Deli and had some fantastic wraps and cool drinks while we sheltered from the baking sun. 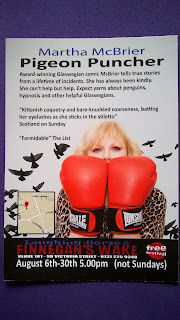 That afternoon as we were strolling past a pub a young chap leapt out and gave us a flyer for Martha McBrier Pigeon Puncher. 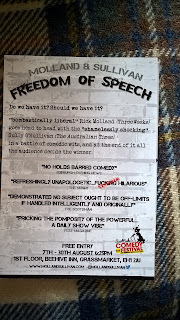 This was a free show in the pub's back room - you just pay what you think it was worth at the end. Sounded like a good deal - plus we were ready for a long cool drink - so we went inside. The gig took place in a back room where we were tightly packed in front of a tiny stage. There were so many people trying to get in! Then Martha herself came in and she told us stories of her life in Glasgow. She was really sweet - a natural-born do-gooder she said. Very sweary - but very sweet! We heard tales of working as a social worker in the Easterhouse suburb of Glasgow. Apparently Glasgow people are very helpful - but don't always look it. The story of the lady at the bus stop was hilarious - you should catch her if you can! At the end there was a vote and I'm pleased to say the right to freedom of speech won out against limiting it in any way! That was the first thing that M&W started their close-up magic show with. While you could toss coins for three years before you got 10 heads in a row - it was that kind of thinking that allowed casinos to make a lot of money! Anyway - it was fun to sit so close and actually join in the games of poker, pontoon and happy families - whilst being bamboozled by their skills. 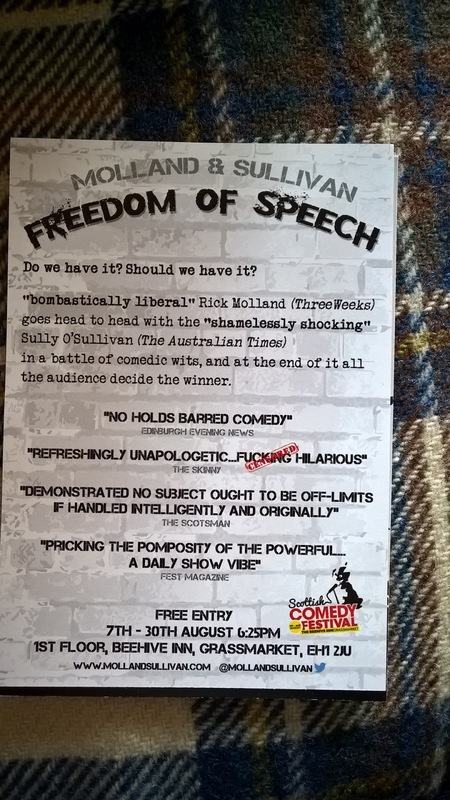 The next day we tried a different tack - we went to the Assembly at George Square Gardens where there was a box office with reviews pinned to a wall too - so you could see who was getting 5 stars. 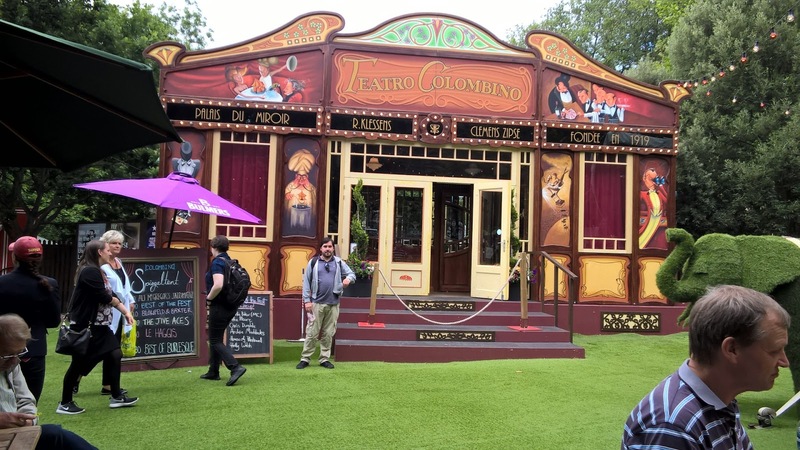 We saw that there was a Best of the Fringe show each day at 2pm - in the incredible Spiegeltent Colombino - which was literally a huge tent with mirrors and stained glass windows. 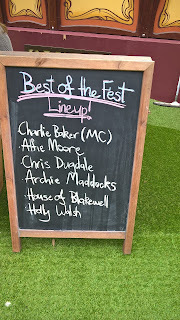 There we saw many acts - for about 10 minutes each - which gave us a good overview of the massive variety of acts available at the Fringe. 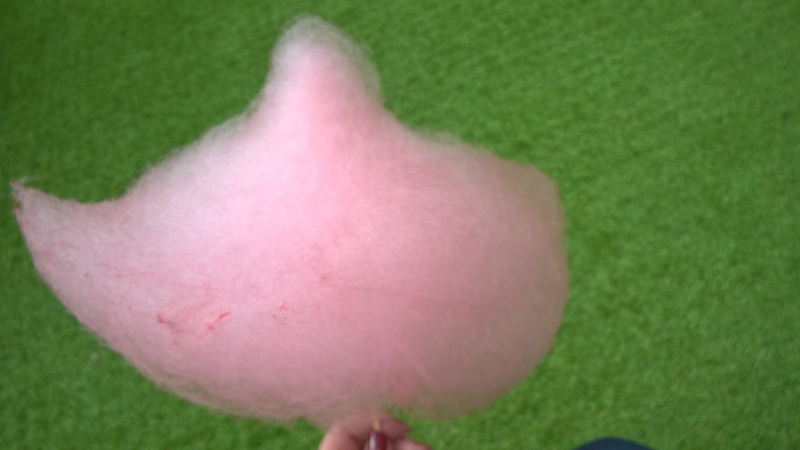 It was so good - we went the next day too! 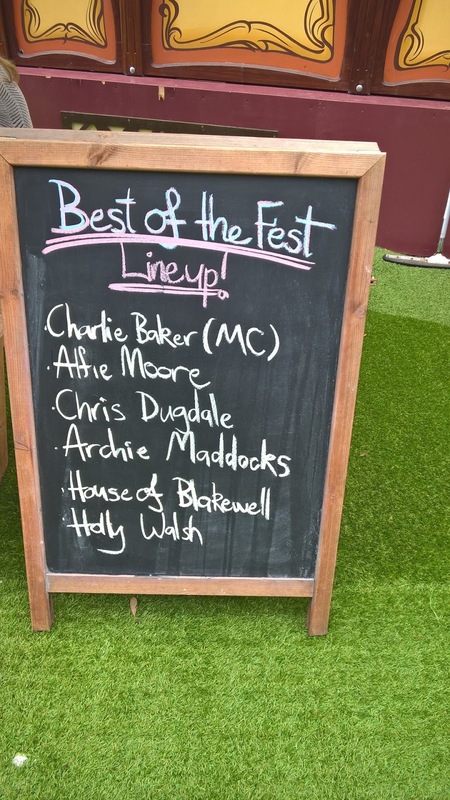 Among the cool people we saw were Archie Maddocks - who really made me laugh with his topical humour and easy style. We read the review board and saw that someone/thing called Goose was getting 5 stars from everyone. So we just grabbed some tickets for that afternoon and went to see him. It was just one man - playing out a parody of a James Bond adventure - playing every character himself! Adam Drake was totally frenetic and funny - and worked so hard he sweated so much he drenched the front rows every time he moved. In fact halfway through he handed out waterproof ponchos and umbrellas to the audience - and nominated one member of the audience to hold a towel and wipe him down now and again. It's impossible to describe the crazy plot - but it made fun of many of the tropes of action movies. He was very clever! Breaking Bad - in 1 hour! The last evening show we saw was something we'd not seen on the review board or on a flyer. 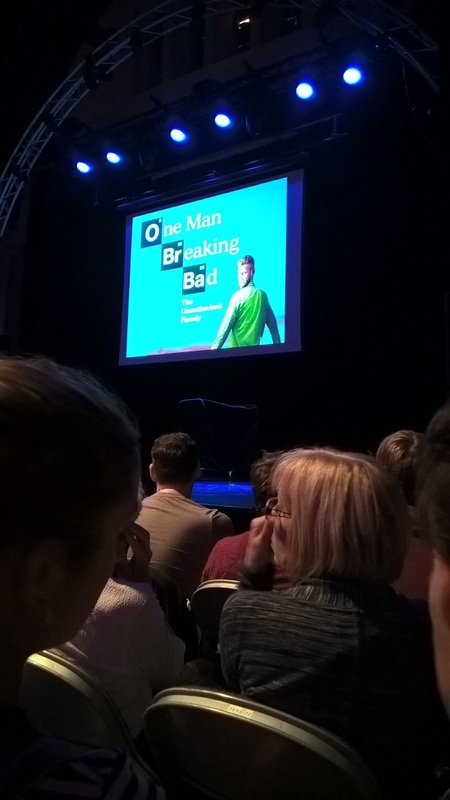 We were just walking past the Gilded Balloon area and saw - stuck to the railings - a poster about a one-man show doing the entire TV show Breaking Bad - in one hour! How could anyone (who's seen the show) resist that? No-one - as the massive theatre was packed with BB fans! 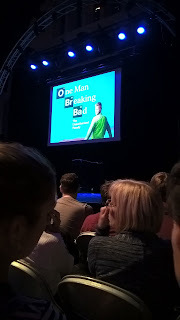 It was called One Man Breaking Bad - the Unauthorised Parody. He is an actor from LA and this has been a hit all over the world! His impersonations of Jessie, Walt Jr. and even Skyler are so brilliant! It wasn't until he pointed it out that I realised that all Walt Jr. does throughout the whole programme is make a website for his dad and eat breakfast! He got through so many breakfasts!! It was good to relive some of the most iconic episodes - he is obviously a massive fan is spot on with his observations. We loved it!